For any additional help, questions about the Agreement for Mutual Respect (Prenuptial Agreement), post-nuptial events and agreements, speaking engagement requests or any of our programming, write to our helpline. How to implement an existing agreement at the time of crisis? "Taanit Esther is International Agunah Day"
רחל לבמור, מנעי עיניך מדמעה: הסכמי קדם-נישואין למניעת סירוב גט, הוצ' אריאל-מפעלי תורה ומועצת רבני ישראל הצעיר, ירושלים תשס"ט, 274 עמ'. 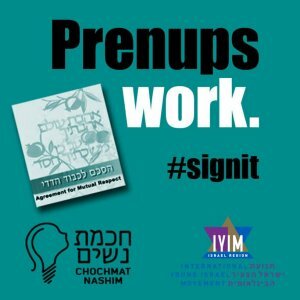 "Save your eyes from tears: Prenuptial Agreements for the Prevention of Get Refusal"
This extensive halachic work is currently available in Hebrew. An English translation is in the works.